I need to talk to you about breakfast. I think we should bring it back. There's much to be said for picnic lunches, dinners both family and candle lit, and midnight snacks. But nothing can approach the intimacy of breakfast. I suppose you can guess that I'm talking about the long and lazy weekend kind, rather than the hurry as you run out the door before work/school and grab a granola bar kind. I really prefer the former. Want a few reasons why? Check out Bordeaux's series on breakfast that he kicked off today on his always wonderful Marita Says (named for his mother, aaww!). There's something deliciously voyeuristic about peaking into someone else's breakfast, in a way that's just not true of dinner. Dinner is often a statement meal, most cookbooks are focused around it, as is our restaurant culture, by and large. But seeing what people make for breakfast when they have hours to spare on a weekend morning is a much more intimate, pajama-clad portrait. So I'm going to let you in on our first meal today, and I have to tell you, this was amazing. This, my friends, was crazy good. I try to reserve such high praise, but this little number deserves it. And it's not even strictly breakfast food. 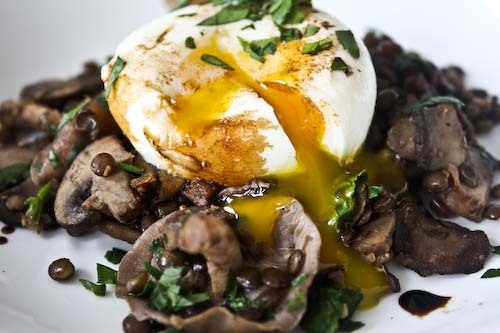 The recipe for this Lentil and Wild Mushroom Hash with Poached Eggs comes from one of my all-time favorites: Anya von Bremzen's The New Spanish Table. If there's one culture that knows its way around eggs, it's the Spanish, who would never dream of restricting them to the earliest meal. This would make a head-spinningly delicious dinner, but for breakfast, it's indulgent without being unhealthy, involved without being difficult. If you've never had the pleasure of breaking a perfectly poached egg over a bed of anything other than toast, now is the time to try it. In this case, the yolk makes for a surprisingly velvety and flavorful sauce as it coats the nutty lentils and dances with a drizzle of syrupy balsamic vinegar. This is one encounter that is not to be missed. In a medium sauce pan, place the lentils and cover with water by 2 inches. Bring to a boil over high heat, stirring at first. Add the 2 smashed garlic cloves and the bay leaf, then reduce the heat so that the liquid simmers. Partially cover and cook until the lentils are tender, but still firm. For Puy lentils, this took 30 minutes, but start checking at 20. Drain the lentils and discard the garlic and bay leaf. Set aside. Heat the oil in a large skillet over medium-high eat and fry the pressed garlic until fragrant, about 30 seconds. Add the mushrooms and cook for 5 minutes, stirring. Add the sherry or wine and continue cooking until the mushrooms are tender and the liquid is absorbed, about another 3 minutes. Season with salt and pepper and add the drained lentils. Cook for 2 minutes more, just enough to allow the flavors to meld, then stir in the parsley. Correct the seasoning if necessary and remove from the heat. Poach the eggs using your favorite method. Whisk together the balsamic and sherry vinegars. 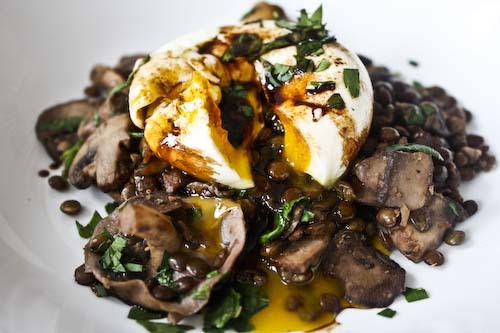 Mound the lentil and mushroom hash on a plate, top with a poached egg, then drizzle the vinegar mixture on top. 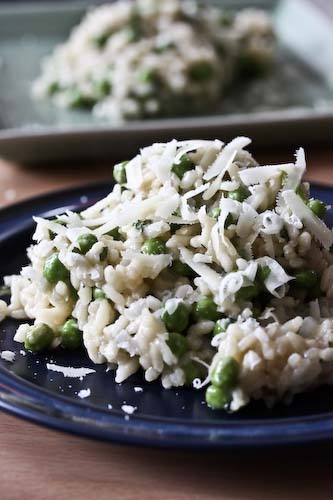 You might also drizzle a little flavorful olive oil around the plate, and garnish with a bit more parsley. 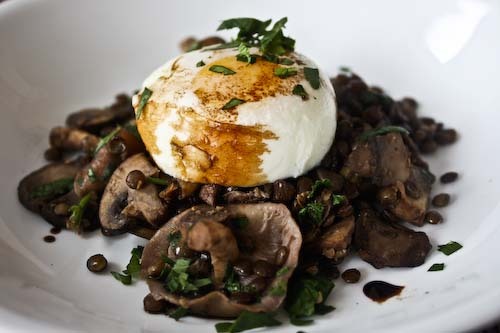 * I used French du Puy lentils which keep their shape and maintain a bit more bite through cooking. I highly recommend them. * I didn't have any dry sherry on hand, so I used 2 tablespoons of a dry red wine. That worked out just fine. * I made 4 eggs for 2 of us, but R could easily have eaten another. * For added interest, I chopped some of the mushrooms and left others whole. You can choose to chop all of them if you like. I'm sending this in to Cooking 4 All Seasons for the monthly My Legume Love Affair, which was started by Susan of the Well Seasoned Cook. This looks amazing!! Especially since eggs and lentils are two of my favorites these days. Look at your perfect poached eggs! That is totally my favorite kind of dinner - we never have time for breakfast like that anymore. But I sure wish we did! wow this looks delicious. I've read that poached eggs are the "healthiest way to cook eggs" so will definitely try this. I just had something similar at a restaurant in San Francisco, but hey cracked a small raw egg over the hot mushrooms tableside. This poached egg looks delicious and I absolutely prefer this cooked egg over the raw. Your poached eggs are perfect! Any poaching egg tips? I've always added a touch of salt and vinegar to the warm water. That looks good enough for breakfast or a light dinner! You're making me sooo hungry! I love egg dishes, especially when the yolk is nice and runny - too good. I can't wait to try this tomorrow morning, or maybe tonight for dinner, I don't know if I can wait. Marvelous! That is the most beautiful breakfast I've seen in a while and it makes me want to cancel all my other plans and have it right now. Again, marvelous! Veggie Belly, aged balsamic rocks my world! I'd actually be interested to see some of your veg breakfast ideas, if you have any! Esi, eggs and lentils go together, it seems! thanks! Dana, this is a dinner, really. But since I made it for breakfast on a weekend it got me out of cooking anything else that day! Denver Native, it's my favorite way! Snooky and Maya, it is actually a dinner, but anything with eggs and mushrooms is just as easily breakfast in my book! 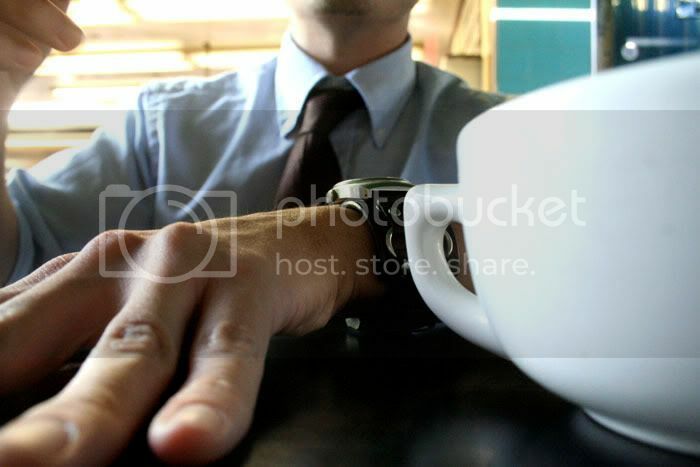 Gastroanthropologist, okay, it's confession time. A few years ago I bought an egg poacher, which is a little pan thats kind of a double boiler thing. You break the eggs into these little cups that are set above simmering water. Cover, and cook for about 5 minutes. Super easy. It's a shortcut, but I poach eggs enough that I don't really feel that bad about it! Hayley, there is nothing better than a runny egg yolk. And nothing more disappointing than an overcooked egg that refuses to run! Bordeaux, don't do that! Your breakfast week is going too well! That looks tasty and healthy! wow..that a lovely picture..thanks for the entry!..adding lentils do sound like a neat twist! This is inspiration for me to actually eat breakfast more! wow!this looks awesome. i really wanna try this recipe but i dont know how to cook :( gonna print this and let mom cook this.